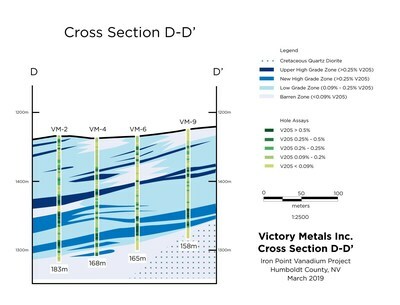 VANCOUVER, March 19, 2019 /CNW/ - Victory Metals Inc. ("TSX-V:VMX") ("Victory" or the "Company") is pleased to announce assay results from an additional 22 reverse circulation ("RC") holes completed at its Iron Point Vanadium Project, located 22 miles east of Winnemucca, Nevada. Victory has now released results for 38 RC holes from a planned program of 69 RC holes and 4 diamond drill holes. The 22 drill holes reported today include both vertical and angle holes and are focused in the central to northern extent of the historical vanadium mineralized zone (see Figure 1). 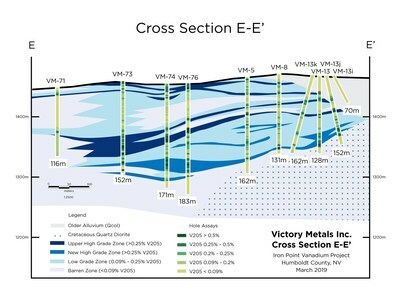 The majority of the holes are shown in three east-west cross sections (see Figures 2-4, Sections C-C', D-D', and E-E'), which continue to demonstrate the excellent continuity and flat lying nature of vanadium mineralization in a large and growing area. Section line C-C' partially overlays the holes previously released on section line A-A' (see Figure 1), and also bisects the north-south holes on cross section line B-B' (see Figure 1), the results for which were previously released (see Victory's February 28, 2019, and March 6, 2019, news releases). Continuity of mineralization in both the lower grade vanadium envelope and the two high-grade zones continues to be apparent. By combining previously announced section A-A' and section C-C', vanadium mineralization shows an east-west strike of 700 meters. The north-south extension of mineralization is similarly around 600 meters, with expansion potential to the south and northwest. Sections C-C', D-D', and E-E' show that vanadium mineralization is open to the west. Hole VM-78 represents the western most permitted hole under Victory's Notice and importantly shows strong mineralization. An historical hole drilled by Aur in 1997 is located 400 meters further to the west of VM-78 and returned anomalous vanadium mineralization. Further definition drilling is planned to better understand the extent of mineralization to the west. Collin Kettell, CEO of Victory, stated, "Iron Point's vanadium footprint is proving to be large and is poised for further expansion. Victory's drill program was designed to test the historical drilling by Newmont and Aur, to assess the lateral and vertical extent of the deposit, and to confirm the continuity and grade of the mineralization. 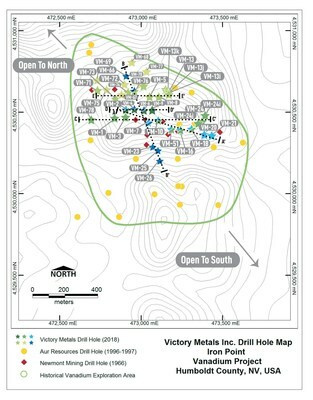 Victory's holes have penetrated deeper than Newmont, intersecting the highest grades to date on the project. Continuity of mineralization in both the Upper High Grade Zone and New High Grade Zone continues to be excellent. Mineralization appears to be still open to the west and northwest, as well as to the south and east. The 38 RC drill results released to date outline a vanadium mineralized zone that is approximately 700 meters in diameter. We eagerly await further assays from the remaining 35 holes." Assay results for intercepts released today are reported in % V2O5. Intercept lengths are deemed to be true thickness given the flat nature of the mineralized zones being tested by vertical holes. 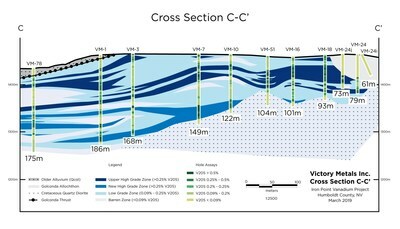 Intercept lengths are reported as an Overall Length, which includes all assay intervals within the vanadium blanket zone (at a 0.09% V2O5 minimum grade), and also as individual zone intercepts reported as aggregate lengths comprised of samples grading 0.25% V2O5 and greater. All intercept lengths have been reduced to true thickness lengths as currently defined by the dip of mineralized horizons shown in Figures 2, 3, and 4. Drill holes VM-13i, VM-24i, VM-66, and VM-68, were assayed but did not return any significant vanadium mineralization. VM-13i and VM-24i were both eastward-directed angle holes that appear to have drilled into an old alluvial channel that eroded part of the Vinini Formation, possibly during development of the ancestral Humboldt River drainage. VM-66 drilled barren intrusive rock, while VM-68 cut a monotonous, strongly metamorphosed pelitic phyllite that might not be part of the Vinini Formation.